Our next issue will be our Annual Review in February but already it’s been a remarkable year. The number of greys reported culled this year has exceeded last year’s total and currently stands at 3299 – a testament to the amazing and effective work our volunteers, contractors and landowners are doing to protect our reds. In the last issue I reported that by the end of June, MADRS had removed over 900 greys from our patch. This control work has continued and to the end of October a total of 1253 had been removed. Again, we stress that this is not a side of red conservation that is taken lightly. It is absolutely necessary to ensure the survival of the reds. As always the damage to trees, predation on bird eggs and fledglings and obviously the spread of squirrel pox would have been so much greater had it not been for the remarkable efforts of our ‘Grey’ team. 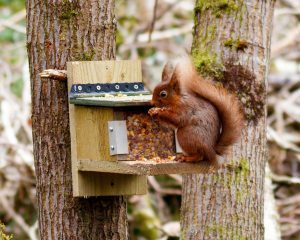 I also reported the increase in red sightings and am delighted to say that we have further sightings and new reports of reds in Borough Woods near Morpeth. (There are photos further on in the newsletter of these little chaps). Our thanks go to BASC (www.basc.org.uk) for their kind permission to reproduce this article which was first published in the November/December 2017 issue of Shooting & Conservation, pages 57-59. 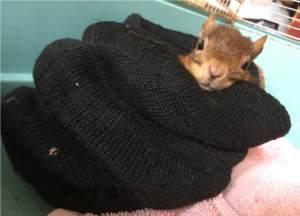 Working with the NGO to promote grey squirrel control groups across the UK to supplement the excellent control work done by BASC and the red squirrel conservation groups. 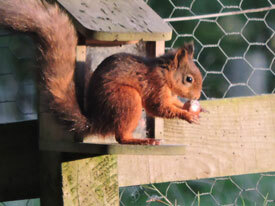 Continuing to support Good Nature while they bring the A18 Trap through the Spring Trap Order tests and legislation. Continuing with funding research into a grey squirrel lure and always on the lookout for new and novel grey squirrel control methods. Welcoming new trustees and members of the management committee to keep our focus sharp and current. 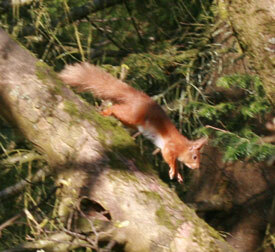 Reviewing our position on Pine Marten as a biological control predator for the grey squirrel. 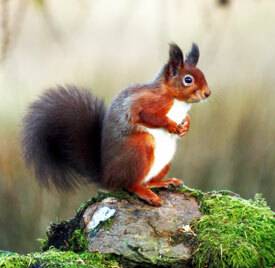 Reviewing the research potential regarding the scale of the landscape impact of grey squirrel damage.